View More In Water Filtration & Softeners. If you have any questions about this product by OMNIFilter, contact us by completing and submitting the form below. If you are looking for a specif part number, please include it with your message. 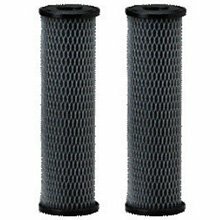 Ideal H2O 738351 Compatible Coconut Carbon Filter, 4.5" x 10"
Aries Filter Works / ResinTech - AF-20-2215-BB - Carbon/KDF 85 Cartridge, 4.5 x 20 in.